USES: Niacin is used with a proper diet and exercise program to help lower "bad" cholesterol and fats (LDL, triglycerides) and raise "good" cholesterol (HDL) in the blood. It is generally used after non-drug treatments have not been fully successful at lowering cholesterol. Niacin is also known as vitamin B-3 (nicotinic acid), one of the B-complex vitamins. It may be used with or without other medications. Lowering "bad" cholesterol/triglycerides and raising "good" cholesterol helps prevent strokes and heart attacks. Lowering fats may also help reduce the risk of pancreas problems (pancreatitis) in people at risk. In addition to eating a proper diet (such as a low-cholesterol/low-fat diet), other lifestyle changes that may help this medication work better include exercising, losing weight if overweight, and stopping smoking. Consult your doctor for more details. HOW TO USE: Read the Patient Information Leaflet if available from your pharmacist before you start taking niacin and each time you get a refill. If you have any questions, ask your doctor or pharmacist. Take this medication by mouth with a low-fat meal or snack as directed by your doctor, usually at bedtime. Taking niacin on an empty stomach increases side effects (such as flushing, upset stomach). Do not crush or chew extended-release tablets. Doing so can release all of the drug at once, increasing the risk of side effects. Also, do not split the tablets unless they have a score line and your doctor or pharmacist tells you to do so. Swallow the whole or split tablet without crushing or chewing. Niacin is available in different formulations (such as immediate and sustained release). Do not switch between strengths, brands, or forms of niacin. Severe liver problems may occur. The dosage is based on your medical condition and response to treatment. To reduce your risk of side effects, your doctor may direct you to start this medication at a low dose and gradually increase your dose. Your dose will need to be increased slowly, even if you are already taking niacin and are being switched from another niacin product (such as immediate-release tablets) to this product. Follow your doctor's instructions carefully. If you also take certain other drugs to lower your cholesterol (bile acid-binding resins such as cholestyramine or colestipol), take niacin at least 4-6 hours before or after taking these medications. These products can react with niacin, preventing its full absorption. Continue to take other medications to lower your cholesterol as directed by your doctor. To lessen the chance of side effects such as flushing, avoid alcohol, hot beverages, and eating spicy foods near the time you take niacin. 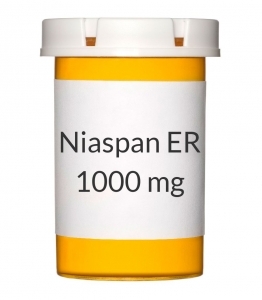 Taking a plain (non-enteric coated, 325 milligram) aspirin or a nonsteroidal anti-inflammatory drug (such as ibuprofen, 200 milligrams) 30 minutes before taking niacin may help prevent flushing. Ask your doctor if this treatment is right for you. Use this medication regularly to get the most benefit from it. To help you remember, take it at the same time each day. It is important to continue taking this medication even if you feel well. Most people with high cholesterol do not feel sick. Do not stop taking this medication without consulting your doctor. If you stop taking niacin, you may need to return to your original dose and gradually increase it again. Ask your doctor or pharmacist for instructions on restarting your dose if you have not taken your medication for an extended period (more than 7 days). It is very important to continue to follow your doctor's advice about diet and exercise. SIDE EFFECTS: Flushing of the face and neck along with warmth, headache, itching, burning, sweating, chills, or tingling may occur within 2-4 hours of taking this medication. Flushing may persist for a few hours after use. These effects should improve or go away as your body adjusts to the medication. Dizziness, stomach upset, heartburn, nausea, vomiting, and diarrhea may also occur. If any of these effects persist or worsen, tell your doctor or pharmacist promptly. To reduce the risk of dizziness and lightheadedness, get up slowly when rising from a sitting or lying position. This is very important if you are also taking medications to lower your blood pressure. Remember that your doctor has prescribed this medication because he or she has judged that the benefit to you is greater than the risk of side effects. Many people using this medication do not have serious side effects. Tell your doctor right away if you have any serious side effects, including: severe dizziness/fainting, fast/irregular heartbeat, severe headache (migraine), unusual joint pain, swelling of legs/arms, vision problems, severe stomach/abdominal pain, black stools, easy bruising/bleeding, unexplained muscle pain/tenderness/weakness, persistent nausea/vomiting, change in the amount of urine, dark urine, vomit that looks like coffee grounds, yellowing eyes/skin. A very serious allergic reaction to this drug is rare. However, get medical help right away if you notice any symptoms of a serious allergic reaction, including: rash, itching/swelling (especially of the face/tongue/throat), severe dizziness, trouble breathing. This is not a complete list of possible side effects. If you notice other effects not listed above, contact your doctor or pharmacist. In the US - Call your doctor for medical advice about side effects. You may report side effects to FDA at 1-800-FDA-1088. In Canada - Call your doctor for medical advice about side effects. You may report side effects to Health Canada at 1-866-234-2345. PRECAUTIONS: Before taking niacin, tell your doctor or pharmacist if you are allergic to it; or if you have any other allergies. This product may contain inactive ingredients, which can cause allergic reactions or other problems. Talk to your pharmacist for more details. Before using this medication, tell your doctor or pharmacist your medical history, especially of: very low blood pressure, alcohol use, bleeding problems (such as low platelets), diabetes, gallbladder disease, glaucoma, gout, heart disease (such as recent heart attack, unstable angina), kidney disease, liver disease/increase in liver enzymes, untreated mineral imbalance (low phosphate levels), history of stomach/intestinal ulcers, underactive thyroid (hypothyroidism). This drug may make you dizzy. Do not drive, use machinery, or do any activity that requires alertness until you are sure you can perform such activities safely. Limit alcoholic beverages. Before having surgery, tell your doctor or dentist about all the products you use (including prescription drugs, nonprescription drugs, and herbal products). This medication may infrequently make your blood sugar level rise, which can cause or worsen diabetes. Tell your doctor immediately if you develop symptoms of high blood sugar, such as increased thirst and urination. If you already have diabetes, be sure to check your blood sugars regularly. Your doctor may need to adjust your diabetes medication, exercise program, or diet. During pregnancy, this medication should be used only when clearly needed. Discuss the risks and benefits with your doctor. This medication passes into breast milk. Consult your doctor before breast-feeding. DRUG INTERACTIONS: See also How to Use section. Drug interactions may change how your medications work or increase your risk for serious side effects. This document does not contain all possible drug interactions. Keep a list of all the products you use (including prescription/nonprescription drugs and herbal products) and share it with your doctor and pharmacist. Do not start, stop, or change the dosage of any medicines without your doctor's approval. Some products that may interact with this drug include: "blood thinners" (such as acenocoumarol, warfarin). Check all prescription and nonprescription medicine labels carefully since vitamins/dietary supplements may also contain niacin or nicotinamide. These may increase your risk of side effects if taken together. Ask your doctor or pharmacist for more details. This medication may interfere with certain laboratory tests (including urine or blood catecholamines, copper-based urine glucose tests), possibly causing false test results. Make sure laboratory personnel and all your doctors know you use this drug. NOTES: Do not share this medication with others. Laboratory tests (such as blood lipids, blood sugar, liver function tests) should be performed periodically to monitor your progress or check for side effects. Consult your doctor for more details.